India, the land of plenty, has been known for the great diamonds, gemstones and jewelry from the ages of rajas and maharajas and before. The jewels from India are priceless and some of the techniques that were passed on from generation to generation are incomparable. 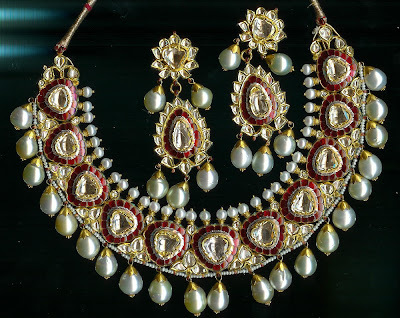 One such technique is the Kundan jewelry which came from parts of North India and is practiced all over the country with variations. Way before the standard proportions of a round brilliant cut diamond were decided upon, and even before the shape of a diamond itself was defined, craftsmen cut the beautiful raw diamonds in whatever shape was desired by the design of the final product. In those days, diamonds and other 'uncut' stones were set in the only form of setting that the craftsmen knew, a technique which came to be known as 'kundan'. Kundan means pure gold and very much like the name suggests, very fine hand beaten sheets of pure gold sheets were hammered together in form of cups or holders or containers to hold the diamond. Each 'cup' was filled with a natural glue like blackish colored substance called 'lac'. This was then covered by a very fine film of pure silver which was used simply to cover the lac and gave a background to the diamond to make it look a bit shiny. The diamond was then 'pressed' in the lac and the edges of the cup were gently pressed onto the edges to secure the stone in place. Once the lac dried up, it would harden thus holding the stone in place. To give a well groomed finish, the reverse side of the products was beautifully decorated by a technique called meenakari or minakari. 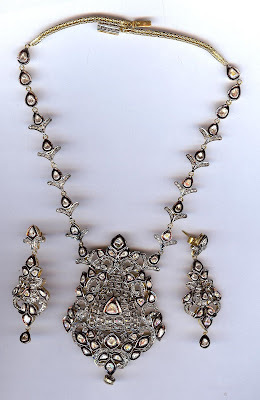 At the time when very little was known about diamonds and imitations, every stone which was set in this technique fell into the category of 'kundan', but eventually, instead of diamonds some artisans started using glass in their products. 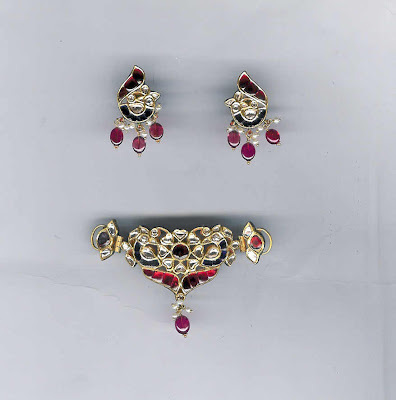 Rubies, emeralds, sapphire and semi precious stones were already being set in the kundan form of jewelry. 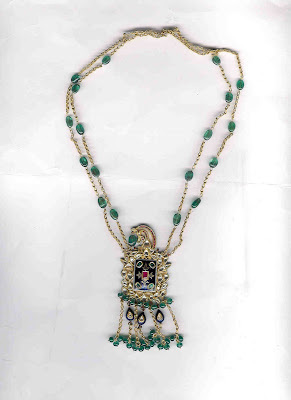 To add color to the products, enamel work was done wherever required which made it more appealing and better finished. 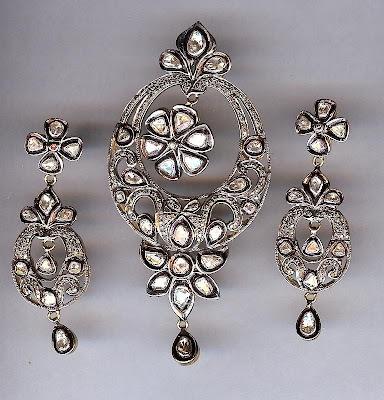 Gradually, the distinction of a diamond from the glass being used in these products was categorised by another technique called 'polki'. 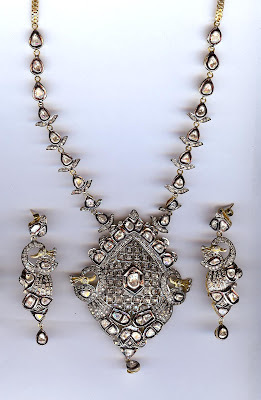 Very little is known about when the word polki was used initially to describe uncut diamonds but when it was used, it came to define the kundan art that used uncut natural diamonds and 'kundan' itself was a word that was used to describe glass imitations of the same. The technical difference between polki and kundan is that 'polki' uses real diamonds and kundan fancies 'glass' imitations of the same. 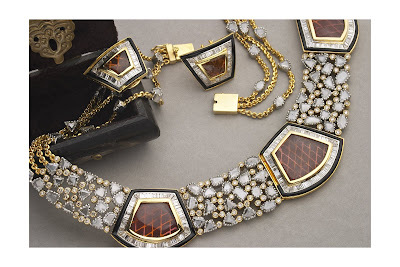 Because kundan is more expensive, therefore the craftsmanship used in kundan products is more refined. 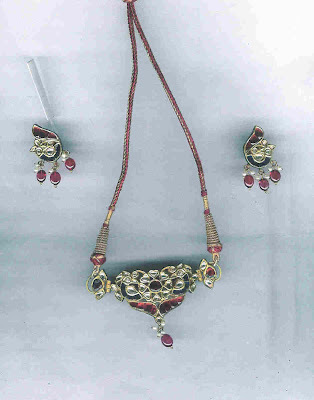 Polki is also created in non-precious and other precious materials such as silver. A new art called "Hyderabadi Polki' has recently come into the market. 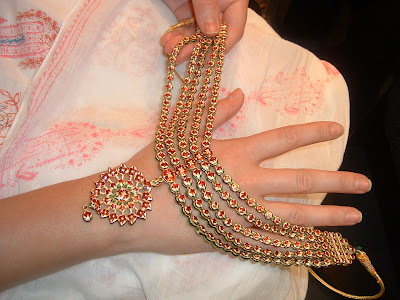 This technique is very similar to the kundan art but there is a difference of the metals which are used. The artisan uses a combination of silver and gold to create a white and yellow gold look, using the of silver and the contrast of gold to his advantage. Usually real uncut diamonds are used in these products and the value of the product depends completely on the design and labor that went into creating each piece. In this technique, the form of the design is created then stones are temporarily set around the design in a mosaic form. 'Rings' of metal are created to fit each stone as it has been set in the mosaic pattern. The rings are then connected to each other by manual linking and the stones are set in. 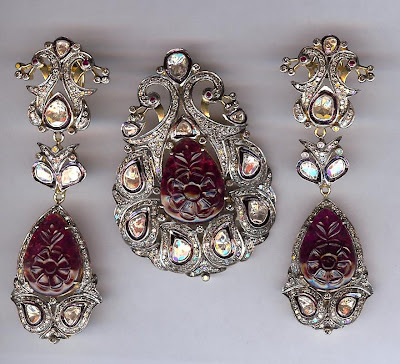 This form of setting the stone looks very interesting but does not justify the use of diamonds and other light colored stones since there is loss of brilliance of the diamonds and other stones. The technique is unique, looks very royal in bigger sizes and intriguing in smaller. 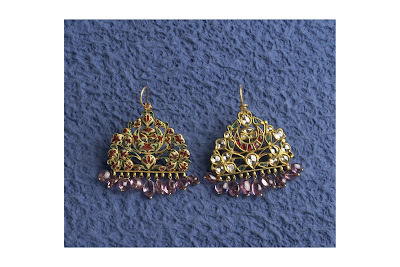 The enamel work done on a metal surface is known as meenakari. 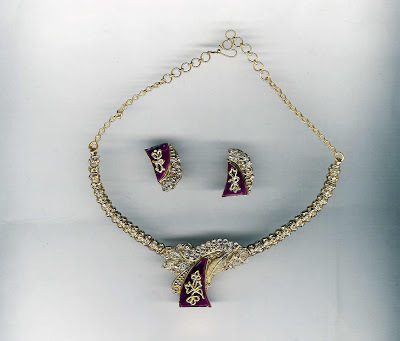 The word Meena stands for enamel and the work 'kari' is the art. 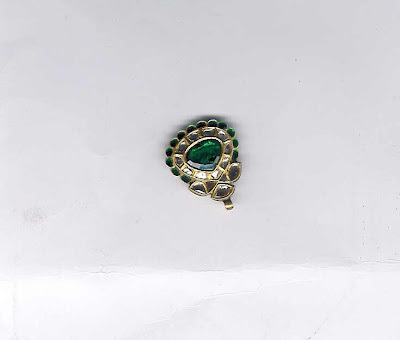 To finish the reverse side of precious jewels, experienced craftsmen would enamel the product with various colors made of natural and treated substances. Glass and other colored stones are crushed into very fine powder and prepared for enameling. Nowadays, chemicals including cobalt oxide, ferrous salts, copper salts and some other salts are used to enhance or create the color used in enameling jewelry. This is mixed in with various catalysts depending on the metal and color used. This powder mixture is laid carefully in predefined boundaries of metal created by either soldering very fine outlines in gold or by hammering into the metal to create grooves where the color should fill in. The color is then 'blown' in by heat torches to melt and fuse in with the metal surface. The trick of the art is to get the heat to just the right temperature where it will melt and fuse the glass into the metal without over heating it and getting it foggy or over melting the surface of the metal. The final effect of meenakari gives a look similar to stained glass paintings. This technique has further been evolved into thewa art work but the original version in itself looks gorgeous to b with. You can get a range of colors, textures, shades and looks with meenakari which would be otherwise impossible to create in jewelry. would you be avaiable for an interview on kundan versus polki? pleases contact me if you are interested. 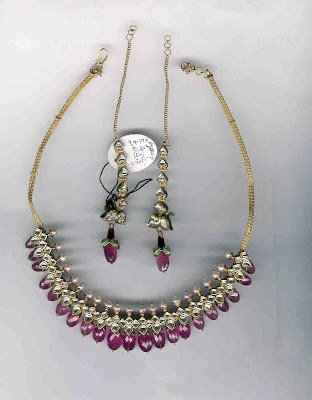 Hi Surbhi, Great article on Polki and Meenakari...are you familiar with the term 'Rani Haar' Is it a good investment with the studded stones and gems?